Natural Hickory’s realistic texture and visual appeal work together to achieve the look and feel of real hardwood. With a light, neutral color that complements any decor style, this laminate flooring is backed by a 15-year warranty and features a durable, ultra strong AC3 wear layer that protects against scratching, fading and staining. Appropriate for residential use, this design is easy to install in any home with its user-friendly locking technology. 23.97 sq. ft. per case. Case quantity: 9. Case weight: 28.5 lb. 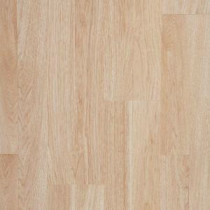 Buy online Natural Hickory 7 mm Thick x 8.06 in. Wide x 47-5/8 in. Length Laminate Flooring (23.97 sq. ft. / case) 367991-00249, leave review and share Your friends.